It’s hard to believe our Lent Madness journey is nearing its inevitable end. We kicked things off over five weeks ago on “Ash Thursday” with 32 saintly souls. With your help, the field has now been whittled down to just two: Franz Jägerstätter and Florence Nightingale. Who will be awarded the coveted 2017 Golden Halo? That, friends, is up to you. Regardless of the ultimate outcome, we’ve met some truly remarkable holy people along the way. Perhaps you learned about some folks you’d never heard of or maybe you renewed acquaintances with saints who have long offered inspiration. Of course the entire notion of placing saints in a bracket is absurd — each “contestant” has already earned a crown of righteousness in addition to a “golden halo.” But at the heart of Lent Madness is the abiding conviction that encountering those who have come before us in the faith enriches and enlivens our own walk with the risen Christ. In the process of this whimsical Lenten devotion we’ve all made some new online friends, encountered a community of believers who take their faith but not themselves too seriously, learned some things, were inspired by saintly witnesses, and hopefully had some fun along the way. Of course we literally couldn’t have done this without our amazing Celebrity Bloggers to whom we offer sincere gratitude: Amber Belldene, Laurie Brock, Megan Castellan, Anna Courie, David Creech, Neva Rae Fox, David Hansen, Beth Lewis, Hugo Olais, Derek Olsen, and David Sibley. Thanks to Bracket Czar Adam Thomas for his stellar behind-the-scenes work in keeping the bracket updated daily. You all rock! 2016 Golden Halo Winner Dietrich Bonhoeffer prepares to welcome the 2017 winner. A special shout-out to Sister Diana Doncaster, of the Society of the Transfiguration, who kept us humming our favorite hymns throughout the season with her brilliant daily musical offerings based on the saintly pairings. Thank you to everyone at Forward Movement for putting up with our shenanigans and producing a terrific Saintly Scorecard this year. Finally, thanks to all of you who participated by voting, commenting, drinking coffee out of Lent Madness mugs, filling in brackets, talking about saints at coffee hour, liking us on Facebook or following us on Twitter, and allowing us to play a small role in your Lenten journey. We’ve loved having each one of you along for the “madness” and on behalf of the Supreme Executive Committee we wish you a blessed Holy Week and a joyous Easter. Oh, wait, there’s one more thing before we set our face toward the Triduum. But first we should note that David Hansen has ably shepherded Franz Jägerstätter through the brackets while Anna Courie has done the same for Florence Nightingale. We’ve asked them for a single image and one quote. We’ve already heard a lot about them and from them — click the bracket tab and scroll down to view their previous match-ups if you want to refresh your memory. And then, it’s time to make your choice in the Fantastic Battle of the F’s. Will it be the umlauts or the lamp? The polls will be open for 24 hours and the winner will be announced at 8:00 am Eastern time on Maundy Thursday. Now go cast your vote — the 2017 Lent Madness Golden Halo hangs in the balance! “A human being does not cease to exist at death. 256 Comments to "For the Golden Halo: Franz Jägerstätter vs. Florence Nightingale"
Yes! the Lady with the Lamp. Not only courage but great empathy and love. Seeing God in every one He created. Florence inspired so many of us that followed her. Yea, Margaret. We are of one mind. My vote has been for Florence since she came on the scene—way back in my grade school days. Been with Flo from the beginning and will go to the end. First time doing Lent Madness and definitely not the last. Thank you everyone for everything. Can I make a suggestion? National Nurse’s Day is May 6th. In honor of Florence Nightingale, or your special nurse, make a donation in their honor to Forward Movement or your local nursing school. Go for the Gold Flo. And I AM a nurse. I’m with you, Oliver! We need more people who stand up for Christian principles as espoused by Franz Jägerstätter simply because it’s the right thing to do. Risked all they had to live true faithful ways. Help us to follow, O God beloved. Franz would not bow to idol; to bent cross. Though told by pious leaders “go along”. Florence lived goodness e’en in fields of blood. We love to sing of glorious saints above! Yet here’s our challenge; living daily love. So may we choose though others may rebuff. Beautiful, Diana. And it just *had* to be “For All the Saints” today. Thank you for your gift of hymns throughout Lent Madness. Beautiful! Thank you for all of your hymns. Diana, your gift of producing hymns throughout this Lenten season is astounding. You have such talent that I have begun to look forward to them. Thank you for sharing your gift. Will miss the daily hymn-fest. Lovely poetry & choice of lyrics. I hope thy become a Lentorium item! Thank you for sharing your talents . I will be downloading the hymns and sharing them. With much love and gratitude. With Diane’s permission, Can i teach my youth this song using her words. Beautiful, one of my favorite hymns. Anyone is welcome to use any of the Lent Madness hymns as seems helpful, meaningful or just plain fun. Many thanks, Sister Diana! Do you have all the Lent Madness hymns collected in a single place? Marguerite, the whole collection will be available in a PDF for free download on the website of my community, The Community of the Transfiguration at ctsisters.org as soon as our website administrator can manage it. I’ll send it to her as soon as possible after the Golden Halo is awarded. The SEC has promised to provide a link to it as well. “We love to sing of glorious saints above! So beautiful. Thank you for all your hymns throughout Lent Madness. You have such a gift. Diana, thank you for your gift to us! Each morning I have mentally sung each hymn—each verse. What a wonderful addition to the already-cherished Lent Madness. Thanks from my grateful heart. This is a fitting climax for your wonderful gift of new hymns this Lent! I especially love the final verse. Give us grace Lord to live that daily until Lent Madness comes around again. Another tough voting day! Both are deserving, but I had to vote for Franz for his courage in holding on to his faith when everyone around him was encouraging him to let go of it. Diana – Thank you again for your wonderful gift of hymn-writing poetry. I LOVE singing hymns and one of the things I lament is that there are wonderful tunes with words that no longer resonate with people today and so these hymns are no longer sung. You have given me hope that hymn tunes could be “recycled” with new words! Thank you so much for your daily inspirational hymns. You captured the essence of the saints in each of them. I looked forward to your daily offerings and will miss them until next year rolls around. Have a blessed Easter. As a church musician and singer, I wish I had realized you were giving is hymns for the pairings! is there a way I could get the list of what you chose for my own personal mediation? Lois, the whole collection will be available in a PDF for free download on the website of my community, The Community of the Transfiguration at ctsisters.org as soon as our website administrator can manage it. I’ll send it to her as soon as possible after the Golden Halo is awarded. The SEC has promised to provide a link to it as well. Wonderful Diane!! Love the words, the perfect tune for today and your our-line summary of these two wonderful saints. Tears of joy! For all the saints! Beautiful! Thank you for all your hymns. Wonderful (and not an earworm I mind today)! Diana, what a wonderful song to honor these two incredible people. Saints who walked along us. Once again Sr. Diana, you inspire and lift our thoughts to our holy God and all the saints who have gone before! Thank you! Sister Diana, I have really missed the color commentators brought to us by Maple Anglican since they retired (or he did), but with your daily compositions, no more. Thank you so much for making Lent Madness and even more enriching experience! Would love to see Franz Jagerstatter honored. I think we in the English speaking world know quite a bit about Florence Nightingale but little about Jaggersttater. I cannot even keep his last name spelled correctly. Sorry voting world! In a world where the press secretary of the United States calls gas chambers “Holocaust Centers,” for me, it has to be Franz. Amen. He is a true saint for our times. Love them both, but…. Franz. Franz wins for me. My 9th-grader is studying the Holocaust right now, and we have had many conversations about everything surrounding it. When he heard the quote about “at least Hitler didn’t use chemical weapons”, he burst out laughing at the stupidity of the statement. One of the things that came up was the actions of individuals, and how much of a difference those actions can make in the big picture. These conversations are so much on my heart that Franz has to get my vote. I agree with Thomas and Emily and Megan. In an age when even high-placed public officials appear to know little about human crises of the recent past, it is important to lift up those little-recognized people who stood up for love and faith and humanity in our own era. My 11th grader took AP European History last year, but had learned much about the Holocaust in previous years, and she was aghast at the press secretary’s ignorance. I think public officials should have to play a few rounds of the board game version of “Are You Smarter Than a 5th Grader” before being allowed near a podium. Yes, Yes and Yes. I suspect we will be praying for the help of Franz as our world goes topsy turvy in the next months and years. Absolutely. I love Florence, but really had to vote for Franz. As much as I love Florence, I really had to vote for Franz. Such courage in the face of evil. I am truly torn with this choice. I am a nurse and believe that Florence Nightingale is saintly, but Franz really hit a cord with me. I would like to see them both honored, and, in a way, they have. What a fun way to learn about people who have influenced believers through the ages! Thank you! Agreed…as a nurse I had to go with Flo, but Franz is equally worthy. Thank you Lent Madness for introducing us to such inspiring unsung saintly heroes! 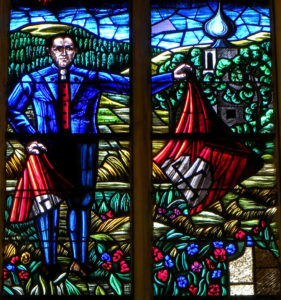 Torn, really torn, like the flag in Franz’s stained glass window. In honor of my late mother-in-law, the daughter of my seminary roommate, and so many of my parishioners, past and present, I am voting for Florence Nightingale. Both final quotations speak great truths of the faith, but the echoes of the Proper Preface for the Burial Rite (“life is changed, not ended) decided my vote. After all, Lent Madness leads to Easter’s joy and gladness! May I write in Amelia Bloomer, please? Agreed!! That’s why I went with Franz! Exactly my reasoning. Love them both for their exemplary lives of service in loving their neighbors in the face of the worst evils humans can do to one another. Like Stephen, Jagerslatter could not be persuaded to bow before evil. What a great and interesting journey this has been…particularly like that we were exposed to some of the ‘lesser Saints’ who’ve gone before us…and thus have broken the walls of isolation from other continents and centuries! A lovely quote from Franz! This has inspired me to read one of his books this summer. “Love of our neighbors is the greatest act of gratitude that we can show God for his love.” What a way to go out on a high note. No matter the outcome for the Golden Halo, I feel enriched by the experience. Amen! So glad to know Franz now, and to know Florence better. This year I will be truly happy no matter how the voting turns out. It comes down to faith or works, doesn’t it. Franz’s faith and courage are a stunning and inspiring example especially in these times. But Florence’s work and her teaching have saved countless lives and immeasurable human suffering and grief. So, the practical humanitarian gets my vote. Very hard vote. A martyr for peace and someone who found a way to ameliorate the effects of war by figuring out germ theory before the men. I ended up going for Florence. Great Lent Madness bracket and year. Thanks! Voted for Franz. Heroic courage in the face of evil, and he stood alone as all around him urged him to accommodate. If he should win, I think it would be a commentary from all Lent Madness voters on what we are living today. Thinking of Franz I am reminded of the scene in Peter Weir’s THE YEAR of LIVING DANGEROUSLY in which Billy Kwan leaps to his the death in order unfurl the following banner from a window along a motorcade route: SUKARNO, FEED YOUR PEOPLE. As I recall, we don’t even get assured that the dictator saw the banner. Yet there seems to me more gospel power in that leap than most sermons I hear. To me, a golden halo for the unsung Franz would be a powerful sermon we need today. After my father in law’s funeral, Flo’s quote wins the day. It’s the Lady w/the Lamp for the gold. In light of the White House Press Secretary’s Hitler comments yesterday, it has to be Franz for the Golden Halo! Between Franz & Florence,they’re both good.But people will vote for someone who has done good,not for their own life but life for others,like being a nurse. All the people that were voted for the golden halo,have done something good with their lives – as well as others. I’ve enjoyed on on those that were up for the golden halo,you learn something new. Being a German, I had to go with Franz. How can we forget what happened to this man and the faith he sustained through it all. This quote really speaks to all generations, LOVE, we must always love. I’m not prejudiced because I’m a nurse…really. We always hear how nurses are saints, well now it’s time to prove it!! Is it possible to have a tie? This is a really hard choice! Both are deserving. I found this a difficult decision to make, but in the end, I just couldn’t let go of Franz. He has won a permanent place in my heart. Go Franz! Both very worthy contenders make for a difficult choice, indeed. There is such an immediate need for the powerful message of Franz to be heard in this world today so my vote is going to Franz. However given the images of suffering we have from Syria and the Sudan, Florence continues to be a timeless example of sainthood as well. It is the Nurses in our lives that keep us whole and healthy. Go Flo!! I don’t know about you, but I am still stunned and bewildered that our country elected Donald Trump president. In the immediate aftermath, I just couldn’t make sense of it. Then, the horror that set in when I realized that overwhelmingly, the Evangelical community (from which I come and continue to reside) supported him. It wasn’t that they were ignorant, rather DJT’s message of bombastic American exceptionalism, racism, anti-environment and shade for Obama ticketed their ears! Since that time I’ve struggled to come to terms with that even as I struggled to find the words and methods to confront my friends – who have come out of the woodwork in my Facebook feed. Fast forward to Lent Madness Where I met Franz Jagerstatter and I have a new friend and guide for my spiritual formation. It’s not JUST his clear convictions and bravery that instructs, it’s his compassionate and Christlike example of not judging our fellows who see things differently. Awwwwwgh! Can I just pinch your cheeks, Franz?! Thank you, SEC. I have found my bearings, have in hand and in heart a great spiritual director to help guide me through our current political climate and beyond. I meant “tickled their ears”! Linda, I’m so glad that Franz has become a friend and guide for you. I deeply admire your courage and convictions; your willingness to stay in the faith community that has left you feeling so shaken and bewildered and to be a faithful witness to Christ’s love there. May you know Christ’s loving presence with you. Thank you for your witness, Linda. I too was dismayed by the traditional “evangelical” position on Trump. You are also the first person here to use the name “Voldemort” openly. Kudos. Nevertheless, current political circumstances have challenged me to think more deeply about what evangelism means, and I take that as a silver lining: how to be in the world without being of the world. (Also, “ticketed their ears” is an amusing metaphor.) Happy Easter. I too have felt what you have the last few months, and, yes, this is why I, too felt that I must vote for Franz. I had never heard of him before this year’s Lent Madness, but he has won my heart. For that, I am forever grateful to the people who put all of this together. I will not be displeased should Florence win. She, too is a wonderful saint and I voted for her consistently right up to yesterday. She is indeed hugely influential right down to the present day in the field of nursing and hygiene. Ah… but Franz and standing up, alone, against evil. I only hope that I could do the same. Amen, Margaret! This choice reduced me to tears, but in light of our current poisoned political climate I had to go with Franz. Linda, thank you for your insight. I was about to vote for Florence until I read your comment. Go Franz! What a powerful message, Linda. Thank you for telling us how Lent Madness has helped you this year. Yes – it was a joy and privilege to get to know Franz this Lent. I’d highly recommend his Letters and Papers from Prison for more beautiful insights like those I quoted this season. So true and well written. Thank you! THey are both ” more than conquerors through Christ”. Blessings and thanks to all faithful folk who shared this Madness. some days it is very important to know that others, across the street and across the world share this journey, and bear witness in myriad ways. Thanks to All theEaster people, Hallelujah is our song! Uh-oh! You said the “H” word. ;-). Now the Rubrics Police will be coming for you. LOL! Very difficult final match-up. But Franz J.’s courage in taking a lonely and solitary stand against evil, no matter the cost, is an example we sorely need in the present hour. He got my vote. Many nurses assisted my father when he went on to his final “vacation”. And I thanked them. Many of my high school students have chosen nursing as a career, and I often tell them how much they rock! All of them honor Florence Nightingale daily with their fine work. But, I will vote for Franz today, as he is an example for us all to stand for Jesus when evil is all around us. Bent cross. Wow. Your hymns are breathtaking Diana. Thank you for them all. What a difficult choice. Faith versus works indeed. Emily Schnabl, I cannot begin to tell you how sorry I am for the losses in your family. Thank you for sharing. Yes, Thank you, Emily for sharing your story. I too am sorry for the losses in your family. I honor and revere Florence and her gifts of healing that changed modern medicine. But the distress and divisive nature of today’s political world call for more Franz Jagerstatters to come forth and speak the truth in love. I won’t try to explain my vote, but I will thank God and the brackets for bringing both Franz and Florence to the final matchup. We need such witnesses in the world today. Two incredible people! Thank you! The irony of (briefly) listening to nonsense coming from W/H press room yesterday while contemplating Franz vs Flo bordered on the absurd. Therefore, I am not voting today. Definitely not in protest but in recognition of Franz who sacrificed all AND Florence who undoubtedly had an indirect presence caring for unimaginable concentration camp suffering. My prayer would be that I could stand as firm in faith as Franz given the challenge. Oh, Jane! So well said! Easter blessings on my fellow ‘madness’ participants! You have graced my life with your insights, research, and understanding. (and, yes, your poems and hymns!) May you see the face of the Risen Lord in all you meet! Florence’s words caught me sharply on the 6-month anniversary of my dear husband’s death, and Franz’s words are bedrock for my life. The choice is so hard! And after reading all the comments so far, I vote for Franz. God bless you on this anniversary, and God bless your husband. I can’t believe we have made it to the end already!! It too will miss singing those hymns each morning. It has been a wonderful journey learning about new saints and rediscovering old ones. Wishing everyone a blessed holy week and a very happy Easter!! Franz takes my breath away. To stand so utterly alone for the Truth of Christ, when his friends, his neighbors, and (most tragically) his Church advised him to do otherwise. His only supporter, his wife Franziska, is equally amazing. She stood behind him in his refusal to submit to evil, even though the cost to her was huge. I thank God for them both, and I vote for Franz. I’m with you all the way, Harlie. You said it so well. Thanks, Diana. I haven’t had much time to comment since Holy Week descended, but it’s good to hear from you! Aaa! Conscience compels me to to credit David Hansen for the phrase “to stand so utterly alone”. He penned that in one of his write-ups for Franz and it really stuck in my head. Thanks, Harlie. I too have been simply overcome by Franz’s story and words. Just what I needed for this season. 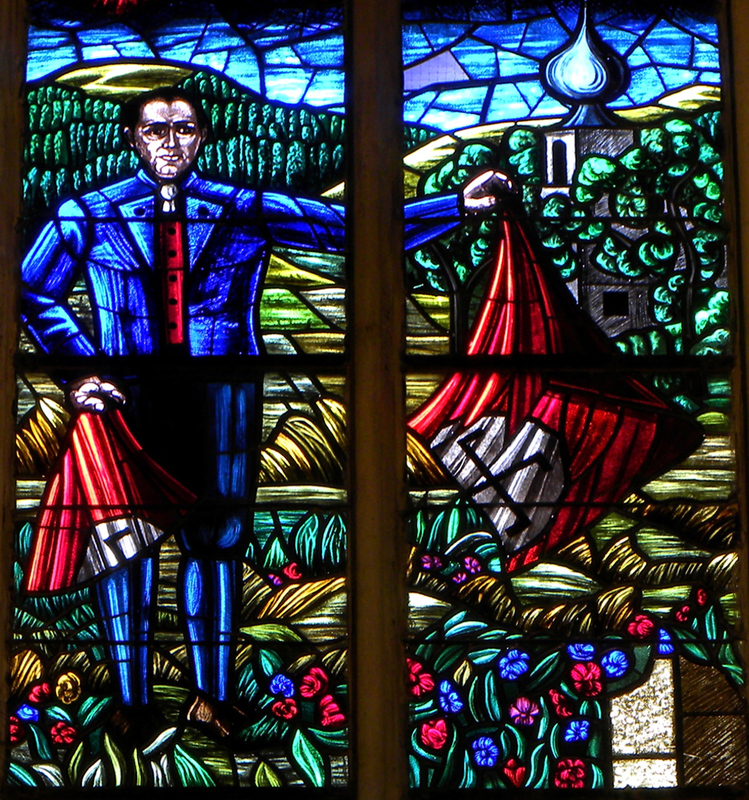 And, fast forward to the ceremony of Franz’s beatification with the image of precious Franziska weeping as she hands over his remains to the Church. Brave Franziska and thanks to God for allowing her to see his and their sacrifice to be so honored. Yes! Such a lovely image of devotion and love. One resisted, one persisted. Both are more than conquerors through Christ who sustained them. Well said, Anne. May all of these glorious saints continue to enlighten and inspire us. Blessed Easter wishes to all the Lent Madness community. “Therefore, love of our neighbors is the greatest act of gratitude that we can show God for his love.” — Franz Jägerstätter” In this day, at this time in our lives, what better message can we hear and bring to action than to love ALL our neighbors? Add to that the message from Cynthia Bourgeault through CAC today “Love your neighbor as yourself”—as a continuation of your very own being. It’s a complete seeing that your neighbor is you. There are not two individuals out there, one seeking to better herself at the price of the other, or to extend charity to the other; there are simply two cells of the one great Life. ” Franz for me. Yes… I saved that meditation from CAC today because of that idea. I think both Franz and Florence exemplified it, in different ways. I found myself wrestling with two great hearts, two responses/actions in the face of the horrors of war. Franz’ choice of humility and the road to his death feels enormously Christ-like. I don’t know if I could do that…. but then each of us has our call… as did Jesus. Florence faces into the horrors with moving in to be a healer… or to offer healing as much as she can as a vehicle of God’s healing hand in our world. I think this is the role that my heart might follow. None of us actually knows what we will do in the moment. Like Peter, we get surprised by “where our feet go” as Frederick Buechner says. But we pray that whichever, God will use our hearts and bodies for his grace. I’m going for Florence in this moment. But I love, and deeply moved by, them both. Florence, you had me at ‘Wesleyan theology’ of social holiness. I am so going to miss all of you who comment. the bloggers, Diana, and the SEC’s words of “wisdom?” This is a wonderful community to be part of. Didn’t we have a golden halo mug and a runner up glass one year? Could we do that again? Anyhow, joyous Easter everyone. A difficult choice! Some of us may need the courage and steadfast love of a Franz, but many of us wouldn’t be here if not for Florence. I’ll vote for her in gratitude. Please consider ordering it through your local independent bookstore and bless your local economy in doing so. Yes, this is a wonderful book! I first learned of Franz in it’s pages. What wonderful people with which to come to the end of Lent Madness. The witness of both of these truly deeply dedicated folks mean so much to all of us who have followed their journey this year. I am overwhelmed by Franz’ dedication to the very end , and by Florence’s tireless work in the midst of the horrors of human suffering. Both have my heart, though I can only vote for one. I hope this vote is so close the the runner up will receive accolades, also. Thank you, bloggers, for inspiring write ups, and Diana for your inspired poetry in song. Both are very deserving of the Golden Halo. Franz was totally unknown to me before LM. Florence was far better known. Florence got the vote this time, for her long lasting contribution to health and medicine. Franz is such an inspiration for me in today’s world, that I have cast my vote for him – as I have done throughout. Though he may lose this to Florence, he will still stand as a beacon to all who work for justice. Thanks for helping us all through Lent! Both are amazing witnesses. Based on the quotes alone, Jägerstätter challenges me – and I think the age in which we live, while Nightingale affirms me. I think challenge is good, so it’s Franz for the Golden Halo. Either way, I will give thanks for how much I’ve thought and learned through Lent Madness this year, and I will surely give thanks to God for both saints tonight. I could not have expressed it better. Thank you. St. Celia, that’s pretty much why I voted for Florence. Franz was enough like Dietrich that voting for him would have seemed like a sequel. Both men were great examples of faith in terrible circumstances, and if Franz comes up again some year (hint, hint, SEC), I’ll be glad to vote for him all the way. Talk about Lent Madness Withdrawal! We’re about to enter it and how! Mornings just aren’t the same without this wonderful community. Blessings to you all–SEC, bloggers, and “commentariat”–in the year ahead! Oh, and by the way, go Franz! Here at the end of Lent Madness, I want to acknowledge and applaud the vital contributions made by this year’s bloggers. The 2017 Pulitzer prizes for journalism were announced Monday, and there is a case to be made for recognizing our evangelism, which also tells the news, the good news, to the people in various media. The mission of the Fourth Estate is very similar to that of the saints: believe in the power of the word to enlighten minds to think critically and inspire hearts to serve others. A free press, like a faithful community, is a collaborative enterprise. This year the following journalistic saints among many others were honored: for national reporting, @FahrentGoldenHalo; for public service, ProPubliCaritas; and for editorial writing, Jesus Calms the Stormy Lake Times. Perhaps it’s only a matter of time before evangelistic blogging joins these genres! Stay strong, fellow pilgrims. There’s a world out there that needs us. Each of you is a saint in the making helping make a world for the saints to dwell in. Blessings until next Lent! Happy Easter. I anticipated this matchup and have been wavering for weeks. Finally went for Florence for how long she had to hang in there, how many battles she had to face, the daily dying to self that others might live, with the multiplier effect, battles that nurses still face who confront doctors about to commit errors. How many of us literally owe our lives to this woman? Florence has always been near and dear to anyone in the medical field..and shall continue. Franz is new to me and some others..but I MUST VOTE FOR HIM AND TAKE ON HIS PRAYER .LOVE YOUR NEIGHBOR..WORDLY NEIGHBOR, THAT IS. At the present time hiis prayer is most important. Thank you so much for this Lenten experience.. it has been most worthwhile. I thought I was going straight for Florence, but that quote from Franz! Almost had me crying at my desk. I must go back to the beginning now, and reassess! Thank you bloggers for your lovely rendering of these lives and thoughtful choices. And thanks to Diana for the hymns. I love LM… will miss it so much! It is sad to see another year of Lent Madness come to an end. This has been a fabulous year, with new and amazing “Saints” that I did not know before. I am still “sad, very sad” that Stephen did not make it to the Golden Halo. I have accepted this and have moved on. Thank you SEC for another wonderful year. I am already lamenting life without Lend Madness. I voted for Franz, whom I see as Bonhoeffer’s spiritual heir. In this political climate, his example is much needed. If Florence wins the Golden Halo and there’s a Silver Halo award this year, I’ll order a coffee mug of each from the Lentorium. Sister Diana, thank you for your hymn lyrics. If The Hymnal1982 is ever revised, I hope to see your contributions in it. Went with Nightingale. Franz is very zeitgeisty right now, what with the nascent fascism and all, but Bonhoeffer won last year, so let’s spread it around. Florence has a nice quote about our transition to the afterlife, but Franz speaks of God’s persistent love for us and relates that love to the reason we ought to love our neighbors. And Franz had literal Nazis for neighbors, so you know he knew how hard following that command of our Lord could be. I voted for Franz for his words on God’s love, his willingness to stand for what is right at the cost of his own life, and because though he was beheaded we can never let it be forgotten that Hitler DID use chemical weapons (gas) on people including his “fellow Germans” despite what a former White House Easter Bunny told the media yesterday. Only the word DID is supposed to be bold. Can we have an edit comment button next year? Please. I liked it the way it was printed. I believe the Spirit intervened here. Also, thank you so, so very much to all the hard-working saints who put this bit of whimsy together for us. Such a treat to play along. I had never heard of Franz before this Madness began, and he captured my heart and challenged my soul. Even if he doesn’t win, he will be my saint to follow this year and beyond. Agree! One of my new heros! Thank you everyone. It is hard to believe we are here at the final round already. I have loved your hymns, Diana and reflected on many of your comments as we went along. I have truly been enriched. May we all have a blessed Easter. So torn so I checked who was loosing and voted for them. Thanks so much to our illustrious SEC, their cadre of wonderful bloggers, our Bracket Czar, Sister Diane, Oliver, and all our commenters. I shall miss this exercise dearly. And it’s wonderful to enter into the Triduum and its holy mysteries enriched by so many holy exemplars. See ya next year. This is really a hard choice today as I have voted for each from the beginning. I deeply admire Franz but, being a nurse and knowing all Flo did to make my chosen first career ( truly calling) I must cast my final ballot for her. VERY tough choice! But in the current American political situation I most need Franz’ reminder of personal, faithful obedience to Christ if and when we seem to be the only voice for justice. Particularly if we are a member of the privileged group (temporarily) holding power. And thank you, SEC, for once again providing us with education, spirituality, and entertainment while stimulating incredible commentary from the faithful voters; I am so grateful for your continuing efforts. In the end, while I admire Franz’s incredible sacrifice and principled behavior (would I be so principled? Particularly when his spiritual advisors are tugging him toward the easy way out), I must cast my vote for Florence, who accomplished so much for the benefit of so many. It is a shame to see it all come to an end, but I have been putting together my candidates for next year, so I have that to look forward to. May God look you full in the face and give you peace! Hard choice. But the story of Franz just tears at my soul. Would we all have the courage to act as he did. Right back to you Supreme Executive Committee – wishing you a blessed Holy Week and a joyous Easter. This was hard, but since I’ve been a nurse for over 45 years, I had to go with Florence, especially when I consider all the abuse I endured in my early years of nursing. What she endured must have been much worse. This has been my first Lent Madness, and I will miss reading all the comments each morning. I feel inspired by this community. I agree with Thomas G. My vote is for Franz. Thanks to all the bloggers for their contributions to my new and renewed learning of the saints on my Lenten journey. I’m all about nurses and I loved Florence’s quote, particularly in light of the recent death of a friend; but, it was Franz’s quote that one my vote. Remembering that all these saints have a Golden Halo, the winner just gets to rock the Lent Madness Golden Halo for a year. The loser? I’d wager they’ll be back on the bracket again! Oh, how I am gonna miss the “madness” with my morning coffee! Madness community, may your Holy Week be truly holy and your Easter joyous! Peace to all! Both Franz and Flo stood alone in their beliefs. People thought she was crazy paying so much attention to hygiene. I did not know Franz before this and was greatly touched by his story, but I have to go with Flo. Franz stood on his principles for himself, Flo espoused hers for others. Plus, I too chose nursing as a profession almost 50 years ago and I truly believe it helps us see and be Christ in and to others. Besides, a Florence Nightingale tea mug would look just wonderful sitting next to my “lamp” that I received when I was capped! As unfair as it may seem to poor Franz, I admit that I’m rooting for Florence partly for sheer Golden Halo variety! Two German men who resisted the Nazis in a row seems a little samey, even though I understand the appeal in our current political climate. Still, I’ll be happy for the winner either way. “samey”? Nice word, and I agree! Both Florence and Franz exemplify sainthood in a broken chaotic society. Franz because he stood against tyranny and evil. Florence because she ministered to the broken and suffering. The examples they offer us are so timely. Eventually I voted for Florence because I associate her with the Muslim White Hats of Syria. I associate Franz with the thousands of political prisoners in the Middle East. Both wear halos in my mind. not have any problem drinking my morning coffee from a “Franz” Golden Halo mug. Will miss this, as I do every year after Lent Madness is over. One of the highlights of Lent for me. I just love learning more about our predecessors in the faith, especially the new offerings I am unfamiliar with. Hurrah for Lent Madness! Win or lose, Franz will live in our hearts and minds, thanks to our whimsical madness. I learned of him in reading Robert Ellsberg’s collection All Saints (1997) and wrote about my new awareness in a blog I’ve kept for the past decade. More importantly, I found a YouTube lecture by Notre Dame theology professor Robert Krieg who is the translator of Franz’s letters from his prison cell. Until next year, be at ease, friends. Sr. Diana your hymns fill my heart and soul. You truly have a gift from heaven. My son is in the hospital after surviving a suicide attempt. I thought that in light of the excellent care he has received from some wonderful nurses it would be a no brainer for me to vote for Florence. But I read the quote by Franz. Then I reread it. He described the foundation of the strength we all need to live in this world, and the call that we all have no matter our profession. His actions illustrated that strength and that call. I believe God through Florence saved my son’s life, and I believe that God through Franz will give him the strength to truly heal. Thanks Lent Madness for a powerful testament to God’s love in our world. I was moved by Franz’s quote, also!! Prayers going out to your son during his recovery and beyond. Happy Easter! God bless you and your son, Erin! Much strength in the days ahead. Thank you, Susan. This Lent Madness community has been a true gift. Erin, I rejoice that your son survived the attempt, and I hope he will receive quality mental health care to truly thrive. And I hope that through all of us many can be recipients of good healthcare and a just system. Prayers for you this Easter and beyond. Thank you, St. Celia. We must rejoice for what we have and we have so much that is good. Thanks be to God. This has been so fun and I learned a lot about giants of faith. They’re both incredible examples. It was a hard choice, but I chose Florence because while they both had amazing lives, her work has done the most continuing good in the world! This has been the best Lent Madness ever, with some very challenging match-ups. Thanks to all the celebrity bloggers for thoughtful and insightful descriptions of their saints. An educational and enjoyable Lenten practice! I had never heard of Franz Jägerstätter before but his comments on nominal or lukewarm Christians have actually guided my personal meditations throughout Lent. Didn’t expect that! I’m sticking with Florence In honor of my mother who was a nurse but most importantly because she brought the light of God’s love to the sick and dying. I’ll miss Lent Madness so much. Thanks to the SEC, the bloggers, Sr. Diana for the magnificent hymns, and all who made such thoughtful comments. I found today’s choice difficult but voted for Franz, a man I have long admired, although I certainly wouldn’t be unhappy if Florence won. I hope there will be a Silver Halo again this year. Both are saints for our times. Courage and prophetic voice for good in the face of adversity and evil. In the end, this nurse had to vote for the one who lead us all in compassion and science. And the has tag she persisted speaks to me. Both are worthy of the Halo, but in the end I had to go with Franz. I could see myself leading a life similar to Florence, but not sure if I would be strong enough to stand up for my beliefs knowing that I would die. Both saints for this time. But this nurse has to vote for the hometeam. And in this time, the #nevertheless she persisted spoke to me. I voted for Frank. Jaegerstaetter was new to me, and I admire his spirit. ( For those wondering about the extra e’s, they are used in place of Umlauts when necessary). I started this journey voting for the less-chosen saints, and it looks like I’m ending that way too. I don’t mind at all. Thank you for the laughs, the learn, and all the hard work you do for us. It’s REALLY appreciated!! I’m still voting for Florence Nightingale. As Lent brings Easter, May God bless and keep you all. Florence continues to impact the lives of individuals today as though she was still practicing nursing. Because her legacy is still so important today, she gets my vote for the gold halo. How have we done this to ourselves again? This is a stellar matchup and I have thought a lot about it since I cast my vote yesterday. Both Fs gave their lives for their neighbors, both are saints who spoke out persistently, and both are worthy role models for our times. At least for me, both were contemporaries of my grandparents, and Franz was a contemporary of my parents, making both Fs easily imaginable Saints Alive for me. Why oh why oh why can’t I choose both??????????????????? This is my fifth year of Lent Madness, and I am so thankful for Tim and Scott and the Celebrity Bloggers for putting it together. Easter blessings to them and to all who participate–have a great year as we continue to walk in the way of Jesus and the saints who continually inspire us! I vote Diana for the Golden Pitchpipe! I second your motion Judy. Though I have participated in Lent Madness for several years, this is the first year I have read most of the comments and commented myself. I got pounced on yesterday for my diatribe (I admit I was wound up on a subject close to my heart). But today I would only add my thanks to the Supreme Executive Committee, all the bloggers, Cecilia for her wonderful hymns, and wish a blessed Easter to all the Lent Madness community. Either could win today, and I would be happy with the outcome. I did vote, finally, for Florence. I surprised myself by voting for Franz J. Why? Florence was a pioneer for sure and had to oppose entrenched beliefs and misogynism while still showing love. However, she had the choice to leave at any time. Franz had to take a stand when everyone else besides his wife (surely another saint) was against him, and the consequences of his choice were great. I think that was even more difficult, and is a valuable lesson for these current times. Oh, oh, A senior moment (I am 80 and really DO have senior moments. DIANA”S hymns. Sorry, my dear, they are amazing. I picked Florence for my bracket, but, this morning I chose Franz. I see that Florence is well ahead in the vote, but, as a consolation, I discovered yesterday that Terrence Malick is in post-production on a film about the life of Franz Jägerstätter. It is titled “Radegund”. A sign of the times? Wow! What a tough choice! I have voted for Florence every time up to now, but standing up to the Nazi party even when it meant certain death gives Franz the edge in my book. Jagerstatter gets my vote! Thanks for a great Lent Madness! I will miss it! Whew Flo had some Lutheran influence. Now I don’t feel so devastated about Martin Luther losing out earlier. For nurses for who nursing is a calling, a ministry – body, mind and spirit – I vote for Florence. I have seen the miracles. Today I voted for Franz because his story touched me deeply. Perhaps this is because when I was growing up our neighbors were holocaust survivors, and while I didn’t fully appreciate all that they went through at the time, I understand much more now. Franz could have chosen to back down from his beliefs, walked away, saved his own life, but he didn’t. My neighbors were victims and had no choice. Both F’s are more than worthy to wear the Golden Crown. What a privilege to spend time in the company of saints during Lent, those we vote for and the Lent Madness community. Thank you all for your company and inspiration. I will be happy to see Franz or Florence win the golden halo, but I cast my vote for Florence, for all she acheived, both medically and politically, in response to God’s call to serve. I had already posted what I thought was my final post about how much I enjoy Lent Madness and its people. But then I read through all the comments and was in awe of the people who wrote about their lives, their families, difficult situations and how they’ve related to the lives described by the bloggers. And I am even more in awe of the loving responses they’ve gotten from other players. This is a fun game and a learning experience, yes, but it’s much more. Thank you SEC. Did you realize when you started this what it would become? And, in my previous post I forgot to mention Oliver. Hope he’s still with us next year. In my brackets, I had this as coming down to a choice between Franz, and Moses the Black, so I have surprised myself this morning by voting for Florence. Franz’s personal choices and convictions, grounded in faith, are increasingly relevant for our times. Florence’s personal choices and convictions, grounded in faith, changed the lives of ultimately millions of people around the world. An interior Christianity versus an exterior Christianity – this morning, for me, when it came down to it, exterior won. Great, thought-provoking finalists. I won’t be sad to see either of them with a Golden Halo! Happy Spy Wednesday, dear Lent Madness friends! Our Lenten journey is almost complete. Go with Flo for the Golden Halo! If more people had heard of F. Jaegerstaetter, this world would be a different place. Florence rocks, but Franz gave the Nazi regime the Christlike equivalent of the finger! That was some bold move! A hard choice between two extraordinary saints, but I am going with Florence and her work with the sick and wounded. The Christian community needs to recognize more women, and I am sure Dietricht Bonhoeffer would be glad to share his golden halo with Franz. I agree! They are together in heaven for certain! As someone who is half-Jewish, I definitely felt it was important to vote for Franz, who had the courage to stand against the Nazi regime. Is it possible we could have a like or thumbs up button for LM 2018? Not a thumbs down, just a thumbs up option. Loved that quote from Franz, so this was a very hard choice. But my love and admiration of nurses gave the nod to Florence. I lift her lamp beside her​ Golden Halo. Both excellent choices, but I had to vote for Florence in honor of my cousin Florence who is a nurse. The founder of modern day nursing deserves my vote. What a blessing it’s been to walk this Lenten journey with all of you. On this last day of Lent Madness, I’m sending a shout out to Scott and Tim, who do a wonderful job every year. I was raised R.C. back in the days of Latin Mass, but am now a member of a U.C.C. church, and have been a fan of this lighter side of Lent for a few years now. Despite my disappointment that my original Golden Halo pick was eliminated in the first (!) round, I have not missed a day of voting. I will miss this site and many of the commenters, and can’t believe I’m saying this but I look forward to Lent 2018! Tim and Scott, you deserve a hearty “well done”! In the end, went for Franz. His sacrifice was foolish…absurd… reminds me of Bishop Curry’s call for Crazy Christians. And his words won me over. I will rejoice for Florence as well, if she wins. Her commitment and faith are just as inspirational, and I never realized before this LM that her faith entered so much into her work. Great to learn of them both. Could have gone with either, but last years’ Golden Halo went to a Christian martyr of the Nazis, so we don’t need two of them in a row. Time for a nurse (they work really hard) who changed the science and profession of nursing (and my wife is one)! Can we have a Franz coffee mug or beer stein? And make the mugs bigger . . . my St Francis mug needs refilling too quickly. And for the wife: a Florence wine glass. It was a very difficult choice today. I voted for each of them in every previous match-up. I was predicting a Nightingale-Jägerstätter match-up in the final ever since Franz’s first appearance. All in all, I felt they were the best of the best in this year’s LM. It was a hard vote today, but I went for Florence, given the long-standing nature of her impact on humanity. Thanks to all for their company on this Lenten pilgrimage. Blessings for the remainder of Holy Week (It’s already Maundy Thursday here in Australia.) and for the season of the Resurrection. Blessings to you, Bob. I’m glad that you decided to enter the commenting arena (where sometimes it can get rather heated). I look forward to hearing your thoughts in next year’s Lent Madness. Wow! Last night my mom and I predicted that Franz would win, and yet just now Florence is winning – 57%! Let’s go Lady with the Lamp! I was not expecting to vote for Florence Nightingale, but that one quote touched me deeply; in these times of terrorism and other persecution, she may just be the saint we need to remind us to see God in everyone. Florence got my vote, but I am so pleased to have learned Franz’s inspiring story. What truly splendid saints are among our great cloud of witnesses. 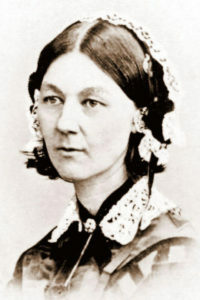 Florence Nightingale was one of the great reformers of the Victorian Age. She revolutionized the profession of nursing in Great Britain and worked to change the laws in England and India to improve the health of their populations. She was a brilliant woman and an accomplished statistician and used statistics to demonstrate the need for improvements in sanitation and health care. She published 147 books on health care. Her nursing renovations were used as a model for improved nursing care in the United States and many other countries. As I find myself in a rehab hospital with a really nice nurse named Florence on the night shift, I’m taking that as a sign absolving me of any further obligation to think. Once again it’s been terrific sharing the Madness with you all. Prayers for your continued healing, Davis, and cheers to your vote for Florence! Davis, very sorry to hear of your ill hap. Such a luxury, though, to be “absolved of any further obligation to think”! Hope your recovery is speedy and luxurious, at the same time, and in this life. Happy Easter. Aand …. She was Anglican! Lent Madness has shone a light on the world this season. Florence Nightingale wins my vote, but all of you (commenters, bloggers, SEC, and the bracket czar) have earned my gratitude. Very tough choice. 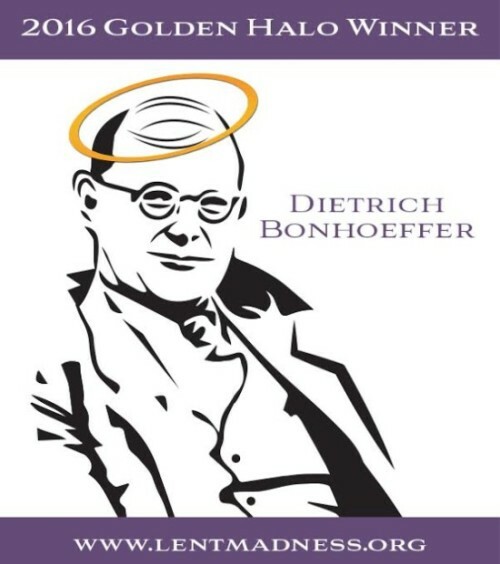 Really the only thing that decided me was that Bonhoeffer won last year’s Golden Halo, and I felt we shouldn’t get into a rut (male Nazi-resisters) but should celebrate the wild diversity of God’s saints. Could have voted for both but went with Florence. Founder of modern nursing, statistician, and for her sanitary reforms which have saved many lives. “To be a fellow worker with God is the highest aspiration of which we can conceive man capable.” To honor a nurse and I also liked the quote on death posted by Anna above. Also, thank you Diana for your hymns. Voted for Franz because of Spicey’s incredibly stupid Holocaust comments. Love both of these saints. And Florence’s quote is gold. Thanks bloggers and SEC! For those of you despondent that “your saint(s)” didn’t win (or advance) this year, the SEC will have a Call for Nominations for 2018. Please nominate as you will! Last year, Florence Nightingale was nominated via this process. Have a blessed Tridium and holy Easter season, and we’ll see you all during Lent Madness 2018. I participated in some of Lent Madness last year; my second outing was the first time I followed every day and read the comments. I learned so much! My thanks to the SEC, bloggers, behind-the-scenes crew, the online LM community, and Diana for her extraordinary, inspirational hymns. Pumped for edition 2018!